The first time I made gumbo, I remember wondering if there was such thing as a vegetarian version. Years later I learned that, yes, there is actually a tradition of a vegetarian gumbo. It’s called Gumbo z’Herbes or Green Gumbo. It’s less common than meat- and seafood-filled gumbos, but it came about as a type of gumbo to serve during Lent or specifically on Good Friday. I’d been thinking about making this while local greens are in season, and I finally did it, fittingly during Lent. This is more of a soup than thicker gumbos, and it’s filled with whatever greens you have on hand, herbs, green onions, and in this case, chopped turnips. The recipe I followed is from Crescent City Cooking by Susan Spicer, and every time I use this book I find more dishes from it that I need to try. I liked that she gilded the dish a bit with the addition of fried oysters. And, why not? You wouldn’t want to serve a gumbo that’s entirely virtuous, right? Naturally, it starts with the trinity of vegetables which includes onion, celery, and green bell peppers. And, this is where things get scandalous. I prefer just about any other possible color of bell pepper to green. Here, I used a mix of green and orange, and I don’t feel too guilty about it. Chef John Besh recommends red bell pepper for his etouffee; so I’m not alone in this. Now, for the turnips, I was hoping it wasn’t too late in the season to find some at the farmers’ market, and luck was on my side. At our Wednesday market, I found the cutest, little white, Japanese turnips grown by Animal Farm. The flavor is mild and lovely, and they were perfect for the gumbo. Although this is a Lenten, vegetable-based kind of gumbo, the recipe does call for chicken stock. I made some vegetable stock to use instead. To begin, you need to make a roux in a wide, heavy pan like a Dutch oven, and making roux is one of those cooking-related tasks that I really enjoy. I love watching the color slowly transform from beige to brown while stirring and stirring. For this recipe, the roux was taken to a peanut butter color. At that point, the trinity of finely chopped onion, celery, and bell pepper was added. Next, finely chopped garlic, those lovely little chopped turnips, and some chopped green onions were added and allowed to cook for about five minutes. For the greens, I used washed and torn kale leaves and spinach leaves along with the leaves from the turnips. All the greens nearly overflowed from the pan, but they cook down in no time. Once the greens were wilted, thyme leaves and file powder were added followed by the vegetable stock. The stock was added slowly, brought to a boil, and reduced to a simmer. A bouquet garni of parsley stems, a bay leaf, and thyme sprigs was added to the stock, and it was left to cook for an hour. If you’re making the fried oysters, the oyster liquor can be added, and Worcestershire sauce is suggested for seasoning as well. To make the oysters, they were first dusted with cornmeal and then quickly fried just until golden. The oysters I brought home for this were tiny, so they only cooked in the hot oil for about two minutes. The gumbo was served with white rice, the fried oysters, some extra chopped green onions, and hot sauce on the side. I now know that regardless of the main ingredient in a gumbo, it’s always a fun and delicious dish. The trinity cooked in a brown roux never fails, and I never get enough of liberally dousing a gumbo with Crystal hot sauce. 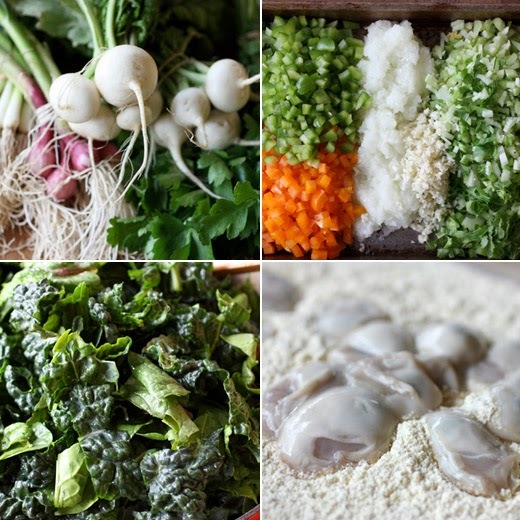 The greens and turnips cooked to a completely tender state and took on the flavors of the herbs and aromatics. I still love a good seafood gumbo, but I think this vegetable version, with or without the oysters, deserves more attention than it gets. I have never had or made a gumbo either. Those fried oysters look great. Looks great, Lisa. The fried oysters are inspired. This reminds me that I've never had fried oysters and want to try them!! I still have never tried making gumbo.. Yours looks just delicious! What a gorgeous gumbo!! I thought I would never get to try gumbo now that I'm a vegetarian, but apparently not! YES. Ha! 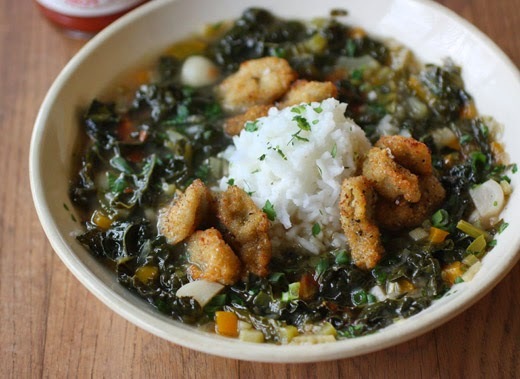 I LOVE the idea of a Lenten gumbo. Perfect! Love, love it! Until I saw this post it never occurred to me to think outside of traditional gumbo. This is awesome. Thanks for the inspiration. Wow does this bring back a lot of memories. My grandparents, who live in Seattle, used to love having fried oysters with fried eggs and some sauce (I can't remember I was young) for breakfast. I was so curious why oysters for breakfast? But my grandfather loved them, a lot. Now I do too, but never figured out the sauce, my mom thinks it was cocktail sauce--yum! What a perfect Lenten meal! I love the addition of fried oysters...they would be the first to go! Fried oysters is a creative and oh-so-fine addition to an already magnificent dish! This is one beautiful gumbo. I have tried a gumbo once. It was hearty and comforting. I am sure yours tasted amazing, especially with those fried oysters! That's amazing looking, Lisa. Absolutely love the idea of the fried oysters on top! Lenten Gumbo...made me smile and remember all my mother's Lent (and Friday) meals. I've seen recipes for this dish, but have never made it myself. I'm going to have to put it on the list! This looks so terrific. I do like green bell peppers, but often trade them for the red, simply because I like the color (and the flavor is a bit more interesting, too). Love the addition of the oysters to this! Really good stuff -- thanks. 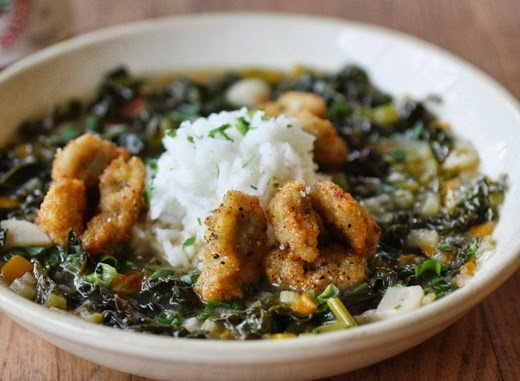 I only had gumbo when visiting New Orleans...and must admit that never made it at home...I like that yo have lots of greens in it and yes, fried oyster just add a nice quick to it...yum! Lisa this look absolutely delicious Heavenly! !